Thunderbolt 3 is awesome. The connection is blazing fast, and for convenience, it uses the same connector as USB-C. It allows a computer user to expand the functionality of their laptop with ease. Keep in mind, however, while USB-C devices will generally work with all Thunderbolt 3 ports, TB3 devices won't work on normal USB-C ports. Ultimately, Thunderbolt 3 is the superior standard. Best of all, it is supported on Windows, Mac, and Linux. StarTech is no stranger to Thunderbolt 3 adapters, and today, it unveils two new products. The company's motto is "hard-to-find made easy" and both of these offerings match that. One product is a Thunderbolt 3 to eSATA adapter -- quite niche these days. It also offers a USB 3.1 gen 2 Type-A port. The other new product is a Thunderbolt 3 to USB 3.1 controller, which is sort of like a USB hub on steroids. "The first new Thunderbolt 3 accessory, the Thunderbolt 3 to USB 3.1 Controller Adapter, provides dedicated USB 3.0 bandwidth to three USB-A ports and one USB-C port (total of 20 Gbps). The adapter gives the user access to high performance USB peripherals such as storage controllers and 3D scanners from Thunderbolt 3 based laptops. 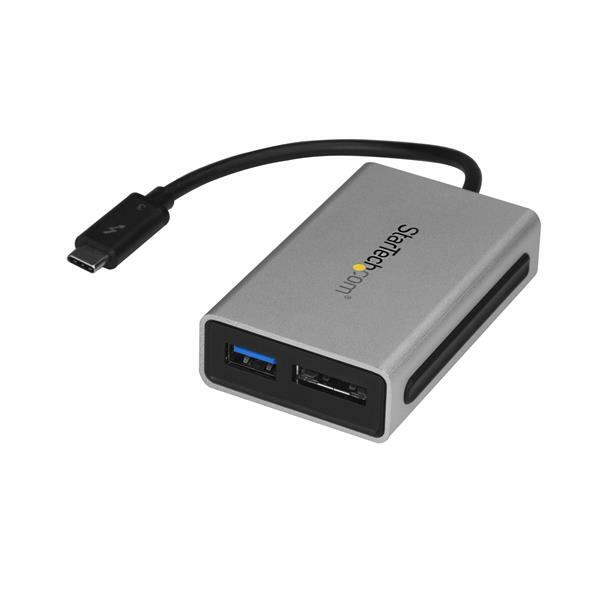 The second new product, the Thunderbolt 3 eSATA Adapter with USB 3.1 (10 Gbps) Port, offers connections to an external eSATA hard drive or SSD, and to a USB device simultaneously. Both products are beneficial for Windows and MacBook Pro users, where no USB-A ports are available," says StarTech. Nirav Gandhi, Director, Product Development, explains, "StarTech.com continues to provide connectivity products that take advantage of Thunderbolt 3 technology and maximize the user’s experience while preserving their existing investment in peripherals. These products extend the life of high performance legacy peripheral products while allowing users to transition to a Thunderbolt 3 based laptop." StarTech shares the following features of each product. Both of these products are quite pricey, but with that said, StarTech only sells high-quality products. In other words, not only will they perform well, but they should last a very long time -- earning their price tags. The Thunderbolt 3 to USB 3.1 Controller Adapter can be had here for $264. The Thunderbolt 3 eSATA Adapter with USB 3.1 (10 Gbps) Port can be had here for $135.